Mount Joy Stable's Air France, the dam of multiple graded stakes winning millionaire Smooth Air, as well as grade two winner Overdriven; was humanely euthanized May 2 due to complications from foaling. She was 19. Air France's newborn colt by Bernardini is in good health and has been transferred to a nurse mare at Pope McLean's Crestwood Farm in Lexington, Ky., where Air France spent the majority of her life as a broodmare. Air France was a home bred for Mount Joy Stables. She broke her maiden at three, won an Allowance and then ran fifth in the Lady Sonata Stakes, all at Calder, before being retired for breeding. She found success early and often as a successful producer of racehorses and sale horses alike. In 2005, Air France gave birth to Smooth Air, who would go on to win the G2-Gulfstream Park Handicap, the G2-Ohio Derby, the G2-Hutcheson Stakes, and the Needles Stakes. He also placed in prestigious races such as the; G1-Florida Derby, G1-Metropolitan Handicap, G2-Pennsylvania Derby, etc. He ran seventeen times from ages two through four, won six races, and placed in an additional eight races to earn $1,117,200. Air France also produced the G2-Sanford Stakes winner, Overdriven, who was a $200,000 weanling that sold for $350,000 as a yearling. Her progeny have earned a combined $1,623,931 on the racetrack to date. In the sales ring, Air France was also represented by weanlings and yearlings to bring $450k, $400k, $350k, etc. Her most recent progeny to go through the sales ring was a Keeneland January session topping weanling colt by American Pharoah who sold to Alex and JoAnn Lieblong for $400,000. In addition, Air France has produced daughters who have been successful producers in their own right. One example is Super Phoebe, who so far is the dam of BPW Sky Gold $150,520 and BPW Got Stormy $53,325. Got Stormy recently finished on the board in the $200,000 G3-Edgewood Stakes at Churchill Downs on the Oaks undercard this past Friday. 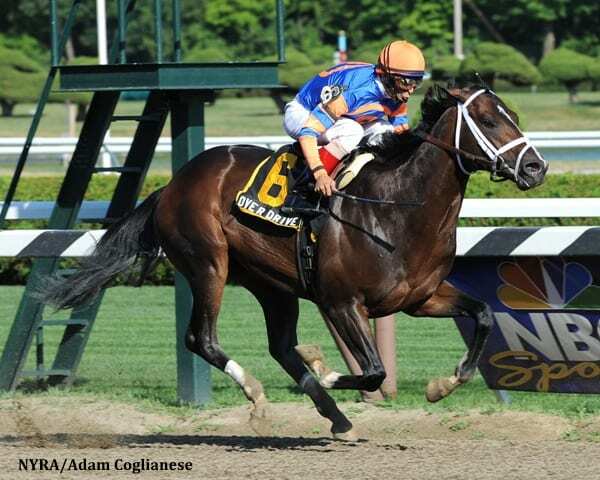 This entry was posted in Bloodstock and tagged air france, crestwood farm, Gulfstream Park handicap, mount joy stable, Ohio Derby, Overdriven, pope mclean, Smooth Air by Press Release. Bookmark the permalink.